If you have ever been to France you will probably have tried and enjoyed this French favourite. Have a go at making them yourself, I still need to practice or at least that is my excuse! Put the almond powder, icing sugar and cocoa powder in a food processor. Pulse until a fine powder is obtained, then sift the mixture into a large bowl. Do not rub through the sift! any large lumps left discard. Place the egg whites in a bowl and beat at low-medium speed. As the mixture turns white slowly add the sugar a bit at a time. After 2 minutes, when the mixture starts to rise and holds its shape, increase the mixer speed. Continue beating at medium speed until firm peaks are obtained. Transfer the beaten egg whites to a larger bowl (if necesssary) and add all of the almond powder mixture. Fold the mixture until the dry ingredients are completely incorporated. This is the hard part, you can mix quite firmly takes practice to get balance right. You don't want to over-mix or under-mix. The batter should be smooth and glossy and have a lava-like consistency. It should form a ribbon when dripped from the spatula/spoon, running constantly but not liquid! if it's too runny you may have over-mixed. Line two baking trays with parchment paper. Fill a large pastry bag half full with batter and, using a 2-cm (1/2 inch) tip. Alternatively use a spoon, but sizes may end up more irregular. Vertically pipe the mixture into small mounds about the size of walnuts (or double size if your me). The batter should be fluid enough that the macarons slowly flatten themselves out. Tap the trays against a hard surface a couple of times to remove any air bubbles. Allow to the macarons to sit for 30 minutes to 2 hours, until a “skin” forms and they are no longer wet when lightly touched. Humidity can be an issue here, too much and the skin won't form properly. Meaning your macarons will crack and not produce a foot. Perhaps rest them in a room other than the kitchen. Bake at 140ºC/145ºC (depends on your oven) for 20 minutes(roughly). Shells should be smooth and shiny, with the characteristic “foot” or ridge underneath. You can tell when they’re done by very lightly tapping the side with a knife or fork. The macaron top should not slide but remain firmly on its foot. Remove macarons from the oven. Slip the parchment with the macarons onto a cooling rack for a few minutes and then remove the macarons from the parchment, they should come off easily. Place finely chopped chocolate in a heat-resistant bowl. In a saucepan bring the cream to a boil. Remove from heat and pour over the chocolate. Stir until melted and smooth, if necessary place bowl over pan of hot water to finish melting. Set the chocolate mixture to one side to cool, preferably not in fridge. But if your struggling for time I don't think it hurts. Once the chocolate mix has cooled. 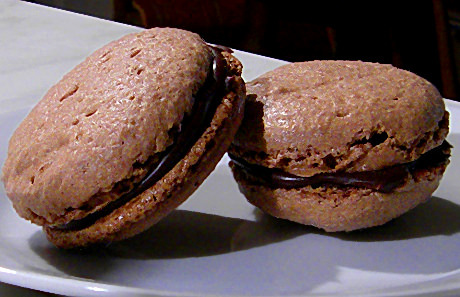 Take one macaron half and place about a teaspoon of filling over the opening and sandwich with another macaron half. Place in fridge overnight to set fully and develop more flavour (at least 8 hours in the fridge or texture and flavour will not be right!). Take out of fridge a little while before serving and enjoy!